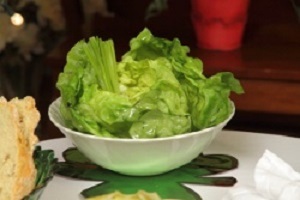 NOTE: These little green salads are made up of Bibb lettuce heads, and served in individual bowls. The olive oil and lemon dressing is just perfect, giving the sweet buttery lettuce a delicious flavor. Serve with crusty bread if desired. 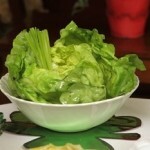 A great salad for St. Patrick’s Day. 1. Arrange lettuce heads in 6 individual bowls. Spread the leaves slightly apart. Plant 2 green onions into each of the lettuce heads. 2. Prepare the lemon dressing by pouring the olive oil into a medium jar. Add the lemon zest, juice of 2 lemons, and salt and pepper. Put lid on jar and shake dressing until well combined. Serve the dressing over the Bibb lettuce heads. Makes 6 servings.